This large carrying bag measures 16x16 and opens by roughly a foot. Plenty of space inside the roomy bag. 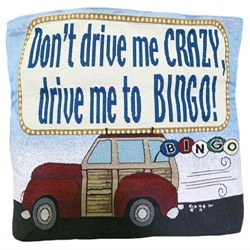 It has the text; "Don't drive me crazy, drive me to Bingo!" embroidered on it. Bingo daubers sold seperately. This large carrying bag measures 16 inches across. Plenty of space inside the roomy bag. It has the text; "Don't drive me crazy, drive me to Bingo!" embroidered on it. Bingo daubers sold seperately.